Killing the desktop: Can you survive in Windows 8's modern UI alone? YouTube’s gearing up to celebrate all things geek from August 4 to August 10, and to get us dorks drooling in anticipation of Geek Week, the company’s teasing us with a little Easter Egg via its Twitter account. If you’re not the kind of person who is keen to parsing numerical brain-teasers*, here’s the answer: “Search YouTube for / geekweek”. 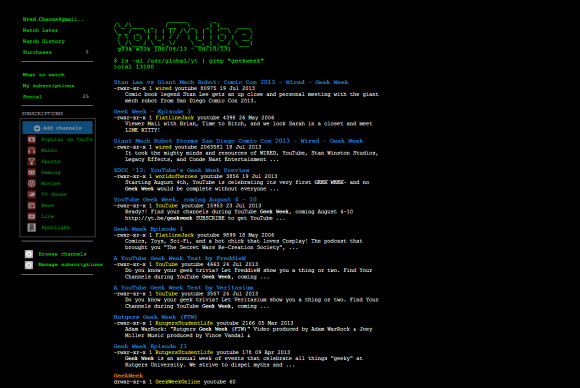 Doing just that—sans quotation marks, and with a space between the backslash and the “g”—transforms the clean and modern YouTube interface into a garish green and black UNIX UI designed to send old-school hearts a-fluttering. Check it out in the picture up top, or better yet, go try it out for yourself. But why stop there? While YouTube’s Twitter account sends you searching for GeekWeek specifically, prefacing any search with a slash brings up results in that eye-gouging interface. Clicking any links other than more pages of results shatters the illusion, alas, and drops you back into the normal red and white YouTube UI. And no, movies don’t play in ASCII art form. If you want to get that geeky, you’ll have to check out the VLC media player. Alternatively, you could spend your morning perusing all the nifty in-jokes that Google has slipped into its services throughout the years by checking out PCWorld’s great Google Easter Egg roundup. * Hat tip to everyone who shared the cracked code answer on Twitter, since I have no clue how to turn all those numbers into words. If you do, please share the secret sauce in the comments!